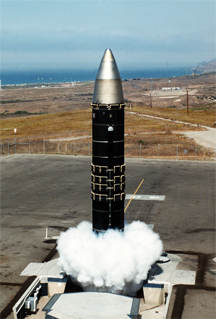 A test launch of an MX missile on 26 November 2002 by the U.S. Air Force. These missiles have all been decommissioned. One of the launch configurations of this missile was to have been mobile and land-based, though it was never deployed in that manner. The idea was patterned after the "shell game." That is, the number of launch silos was to have been far greater than the number of missiles, which would have made attacking them difficult, because the enemy would not know which silos actually contained missiles. This strategy would have reduced the need to harden them against nuclear attack. It's likely that the plan was abandoned, in part, because of advances in sensor technology that would have made detection of missile movements effective enough to degrade the advantages of this launch configuration. What happened to MX is an example of the predator/prey pattern. As the predator develops new capabilities, the prey develops new defenses, in an endless cycle. So it is with budget swaps. You might get away with it when the amounts involved are small, but eventually, budget auditors will develop methods of detection. Photo courtesy U.S. Air Force via Wikimedia. The meeting ended. Will picked up his pad, stood up, tossed his paper cup into the wastebasket, and stepped through the doorway right behind Janet. But before he could get her attention, Ed got his. "Will, just one thing to button up — can you stop by my office a minute?" Ed asked. It was a short walk to Ed's office. They stepped in. Ed closed the door quietly. "Just want to give you the charge numbers for this week and next," he began. He handed Will a slip of paper that had two account numbers on it. "Here they are. Top one's for this week, the other's for next." "OK," said Will. "That it?" Will opened the door, went around the corner to his own office, set his pad and the slip of paper on his desk and sat. Odd, he thought. Why the secrecy? And why split the work across two accounts, when it was exactly the same work? He wondered what was going on. the gray areaWill never did find out. Perhaps it was legitimate, but it might have been a "budget swap." In organizations that track expended effort, people charge their time to various accounts, represented by charge numbers. When "actuals" deviate too far from projections, the manager is often considered to have erred. Managers of overspent (or underspent) accounts are tempted to move charges across accounts to compensate. In effect, they "swap" money across accounts. Here are just a few forms swaps can take. This approach is less common today, because so many organizations now use electronic time reporting systems. Systems that still use hardcopy are the most vulnerable. Ed and Will might be a case of directed misreporting. Typically, this requires a level of naiveté or fear on the part of the person who's being directed. Conspiratorial misreporting occurs when all parties are aware that they're reporting false data. In Parking, team members are temporarily detached from Project A, and then attached to Project B, which has adequate funding. Once parked, they may continue to do "just a little" work on A — a meeting, or a quick phone call, or more — but they charge all their time to B. When two budgets use the same external vendor for labor, equipment, or materials, the vendor can overcharge one of the budgets, and undercharge the other to compensate. Usually, this requires collaboration between the vendor and the managers. It's much easier to arrange when both budgets are controlled by the same manager. For more about budgetary deception in the wider context, check out M. Jensen, "Paying People to Lie: The Truth About the Budgeting Process," European Financial Management , Vol. 9, pp. 379-406, September 2003. Available at SSRN. Would you like to see your comments posted here? rbrenltzPhnyECMLlXqTIner@ChacWJuTOvieoHzvkVECoCanyon.comSend me your comments by email, or by Web form. I offer email and telephone coaching at both corporate and individual rates. Contact Rick for details at rbrenRtOxpfpJqmgazwEkner@ChacOvNUFEUaASzJOSHZoCanyon.com or (650) 787-6475, or toll-free in the continental US at (866) 378-5470.